Constable Karen Thomas, Newcastle Neighbourhood Policing Team, Nuala McElroy, MARA Project Co-ordinator, Patrick and Brian Morgan , Kilcoo Neighbourhood Watch Co-ordinators. A PIR Solar Light Initiative was launched recently by officers from the PSNI and in liaison with the Kilcoo Neighbourhood Watch Scheme and the County Down Rural Community Network as part of the PSNI’s ongoing commitment to Police with the community. Officers from Newcastle PSNI Neighbourhood policing team visited a number of householders in Kilcoo to give them advice on home security. They gave out a number of solar lights to residents in areas where no exterior electric lights are provided. 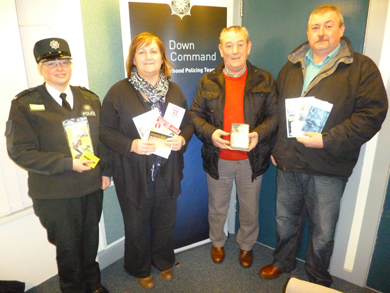 Personal attack alarms and home security leaflets were also given to the more vulnerable members of the neighbourhood. If you would like any advice on home security please contact your local Neighbourhood Policing Team on 0845 600 8000.